Well, looks like Target is the happening store this week. Besides the 75% Christmas Clearance Deals, there are quite a few great deals this week. Here is another deal where you can score Free Market Pantry Macaroni & Cheese. 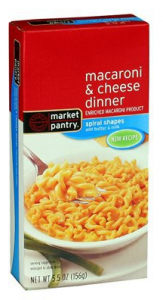 There was a new Target Coupon yesterday for $1 off Market Pantry® boxed macaroni & cheese. The coupon excludes single serve size however, the 5.5 oz box serves over 2 and is priced at $0.59 (price may vary). And, the great thing is, the coupon does not beep and automatically adjust down. Giveaway: Reader Shopping Trips – Win a $100 Gift Card – New For January! !